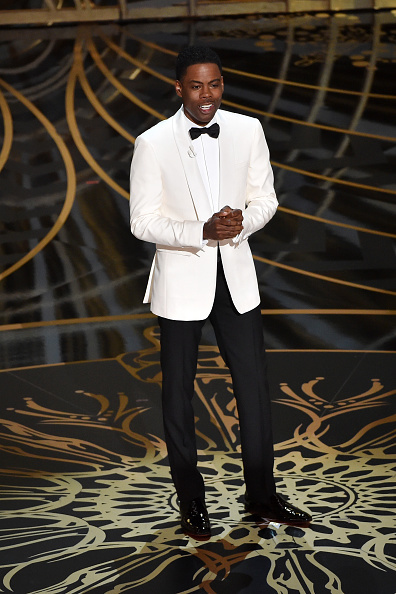 Host Chris Rock wore a sharp Burberry shawl-collar white jacket tuxedo. The lapel has such a unique cut; we are adding it to a must-look list of the evening. Chris Evans was debonair in this Prada navy tuxedo with velvet trimmed satin peak lapel and black velvet bow-tie. The universal appeal of this tuxedo makes simplicity a winner. Ryan Gosling (L) in Gucci with a black shawl lapel, one-button Signoria tuxedo stunned with the white bow-tie on white shirt. 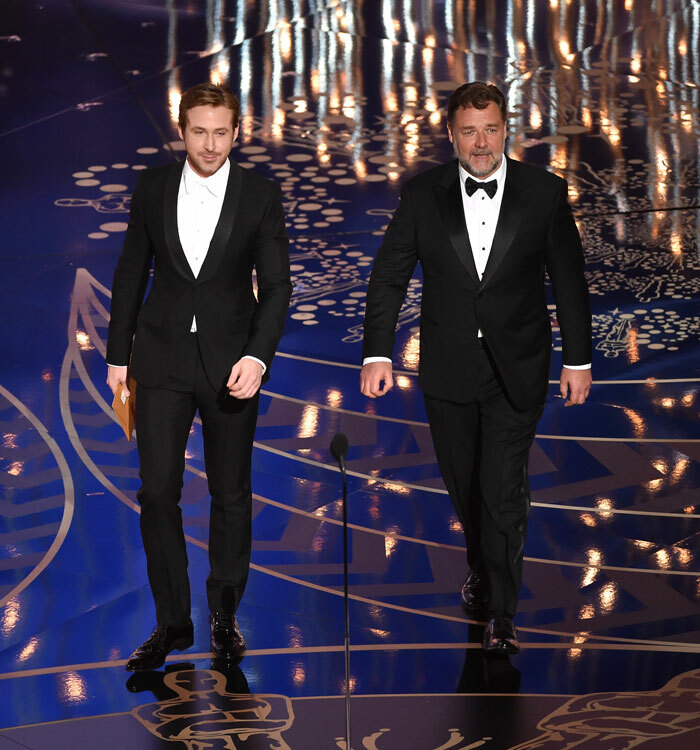 Russell Crowe (R) wore a Giorgio Armani black two-button peak lapel tuxedo with a classic white evening shirt and sharp satin tie and black studs. The Live! With Kelley and Michael co-host wore a ‘preppy meets vintage’ three-piece blue tuxedo. The tux is from his new Michael Strahan line. 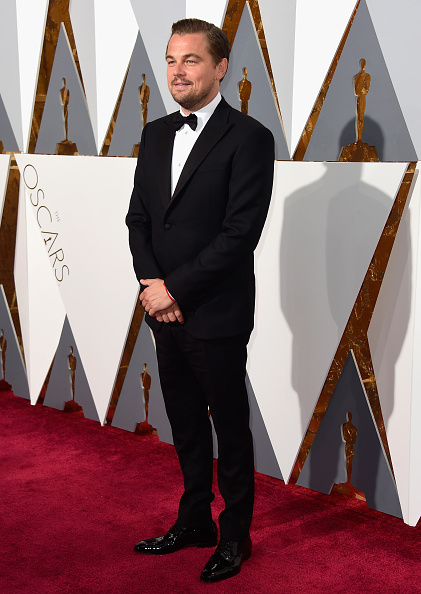 Leonardo DiCaprio, the Best Actor winner won the night for The Revenant and won look of the evening in his stellar Giorgio Armani, Made to Measure tux paired with lace-up shoes by Christian Louboutin. The Best Actor nominee for the Danish Girl arrived in a finely tailored laid-back Alexander McQueen black velvet tuxedo with black satin shawl lapel. The velvet slippers with black socks made the statement even more of an eye catching moment! 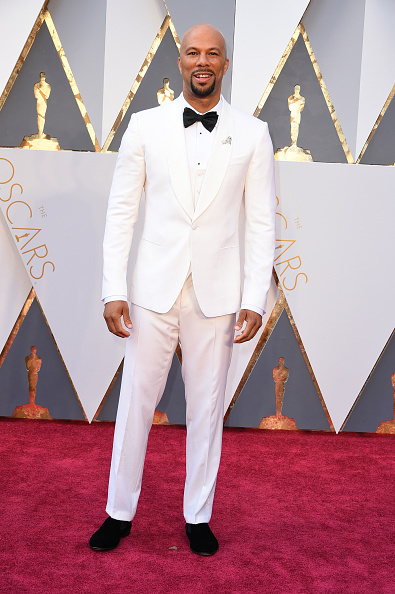 Common’s Dolce and Gabbana all white tuxedo is a bold statement for the evening. Michela Erlander, the star’s longtime stylist, accented the tuxedo with studs, cuff links, and a popping diamond pin on lapel from Fred Leighton. The E! 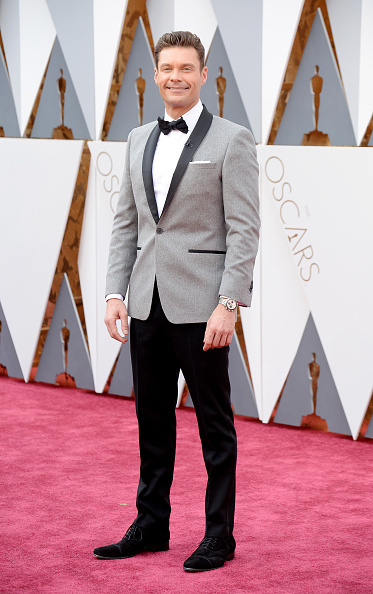 Live From the Red Carpet host went with his own line of menswear. He stepped out in a shawl collar tuxedo with a heather gray blazer, slim black pants and a sharp satin bow tie. 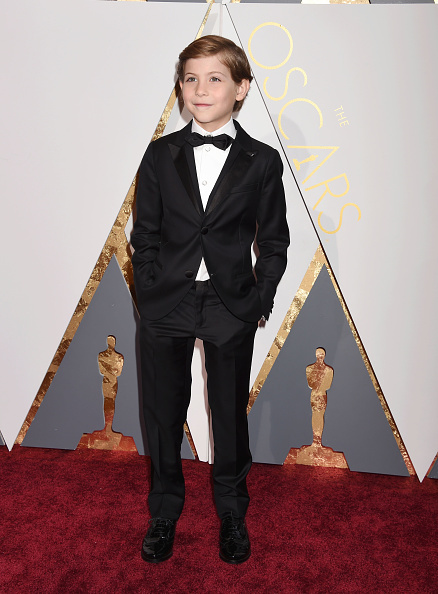 The pint-size actor stepped out in a classic Giorgio Armani tuxedo adorably rocked with a little peak lapel and teamed with shiny lace-ups. 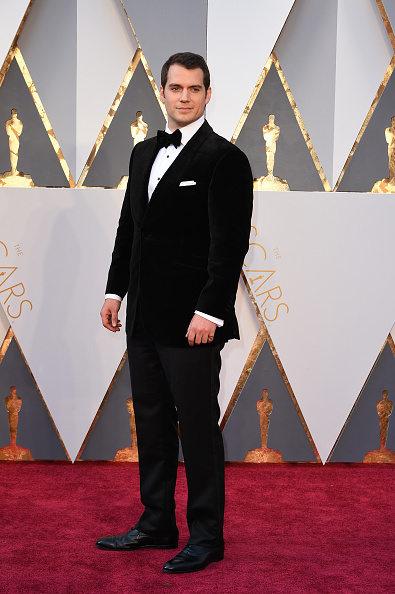 In velvet tux and satin pants by Dunhill, Superman could do no wrong. 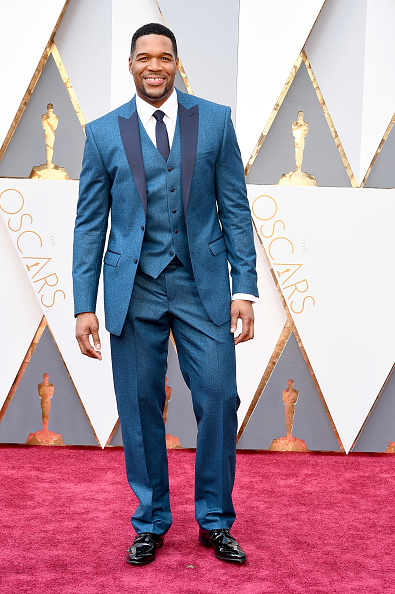 Pharrell Williams mixes it up again with the red carpet’s first male bare ankle! The bleach blonde hair and black brogues made marks, as did the fashion forward music star's Lanvin tux with diamond bracelets and rolled up cuffs. Photo by Todd Williamson/Getty Images. The Suicide Squad actor wore a Gucci tuxedo piped in red with a scarlet rose floral tie embellishment that did not go unnoticed! The embellished snake loafers kept eyes on the star all evening long! 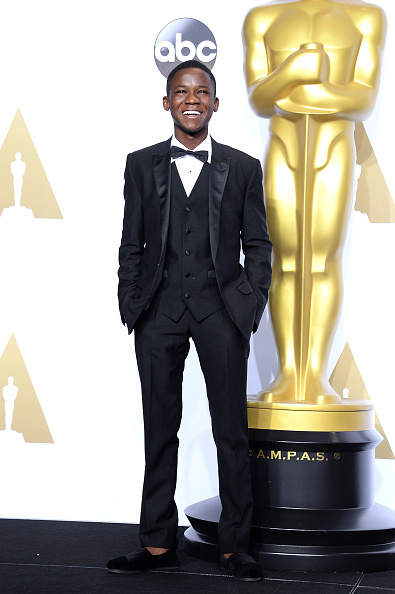 Beasts of No Nation actor Abraham Attah stepped out in posh slippers and this smart, three-piece Dolce and Gabbana tuxedo. The fashionable slippers by TOMS rocked sans socks made the mark. TOMS has committed to donate 10,000 pairs to the 15-year-old’s home country of Ghana. On the arm of his wife Jennifer Flavin, the best supporting actor nominee for Creed turned heads in a navy blue and black tuxedo with black lapels, plus patent lace up shoes. His wife Jennifer Flavin is stunning in Saint Laurent. 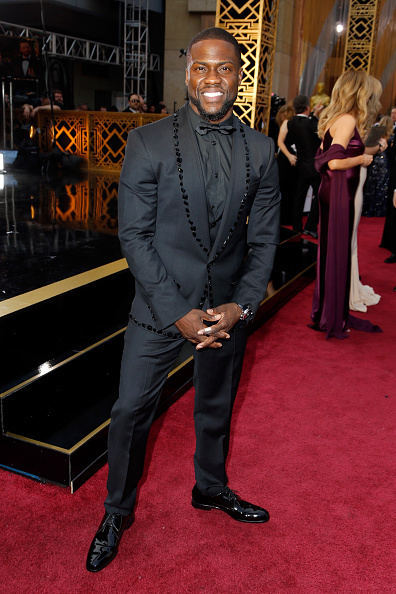 The comedian wore an accented Dolce and Gabbana tuxedo jacket, edged all around in glittering black stones. The comic proved he’s totally on trend, fitting right in with some fully sequined gowns. Oscar’s next host? 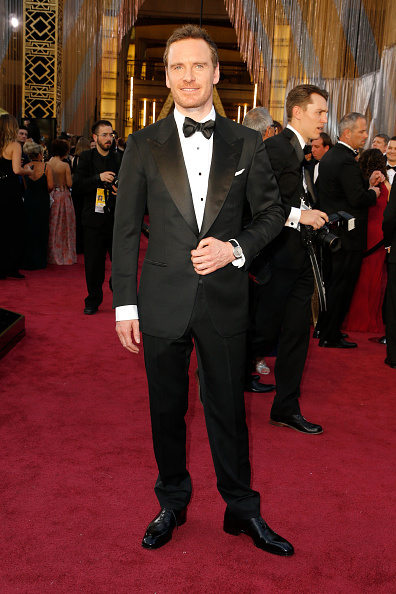 Michael Fassbender wears a Tom Ford Green Carpet challenge tuxedo. Ford was a participant of the Green Carpet Challenge (GCC) this year, and created this bespoke grain de poudre tuxedo, made of fabric known as OEKO-TEK, a European spun wool with a low environmental impact certification. Saving the planet one tuxedo at time? Our favorite fashion legend stepped out in a classic Paul Smith tuxedo, Ferragamo shoes, David Yurman cufflinks, Tom Ford bow tie and Bulgari watch. The amazing actor, flanked by the beautiful Charlotte Riley, donned a classic Gucci tuxedo with rich dark brown insets on the lapels. Photo by Gregg DeGuire / Getty Images.